The Freedom Belt, which I have been talking about a lot lately, just won the “Best Choice” award from the authoritative product reviews site, TopDust.com. That is a huge deal because TopDust is recognized as the most trusted and customer-centric source for expert unbiased reviews on the internet. As much as I would LIKE to believe that anyone reading my posts here at Living With a Catheter would take everything I say as absolutely true, my opinion is of limited value with no other context. 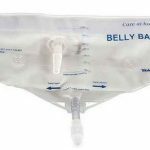 The TopDust recognition provides an unbiased assessment for how effective and helpful the Freedom Belt is for anyone having to wear a post-surgery drainage bag that are the necessary evil of medical catheters. What is going on with the Freedom Belt? I have ordered two and both orders have been refunded. Are they out of all belts? Certain sizes or colors? Hi Lia. I just wrote to Drs. Mario and Justin about this. Last year they were refunding everyone and still shipping – basically giving the belst away. Not sure if that’s what’s happening this time. But they will likely get back to me with the answer later today. I’ll let you know when they do.